INTERIORS by NICOLE is focused on bringing function and beauty into your home through interior decorating, design, color consultation, and project management from start to finish. I am mobile to clients and offer in-house consultations which can simply be one-time or for whole home renovations. I am based in the Greater City of Sudbury and my firm has been operational since 2013. I have a passion for interior decorating and have a background in carpentry, giving me a strong understanding of the renovation process that sets me apart from others in this industry. I also offer 3D visualization images to give the client an as close to real perspective of what the final renovation might look like. My client base consists largely of clients that don’t feel they need a contractor but need help with product selection and finding reliable trades. A trend I’ve observed is that people are sourcing an experienced person to help them make their home functional and beautiful for the whole family, and this is where my knowledge and experience plays a significant part. My clients appreciate the integrity I bring to their project. I understand that all clients have different budgets and needs, some might not even want to change their home but just update it. So I work hard to give them a home they truly love. But at the same time, if I see something that is just wrong, I let them know up front, and they can expect me to be honest in my opinions. My firm’s strengths lie in several elements that have ushered me towards success over the years. For example, I have made interior renovations my specialty, so whether it is the kitchen, bathroom or your whole home, I will help you make it functional and beautiful. I also undertake project management for all small and large-scale renovations. I am the liaison between the client and the trades. I help with all product selections from backsplashes and flooring to paint colors, furnishing and décor items. Lighting is another important element in my design plans which many clients overlook. But in every plan, I acknowledge the fact that people live in their homes. It represents them, and if something is important to them, it stays. I will make sure that it works. I see the entire picture of a renovation, not just the décor elements and I bring that to clients. Renovations can be stressful, and I help clients minimize that stress by acting as the representative on the client’s behalf so that the client only needs one point of contact. I have been lucky to have been recognized for my work and recently I received a ‘Client Service’ award from Houzz and a ‘Best Top Three Interior Decorator’ recognition for the area. However, my most noteworthy achievements are when clients post honest reviews on how I made them fall in love with their home again and helped them achieve their dream vision. 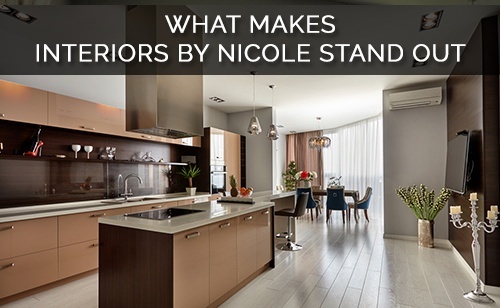 To learn more about all that I do at INTERIORS by NICOLE, please click here. If you have any questions about how I can help you, I’d love to hear from you. Please contact me here.